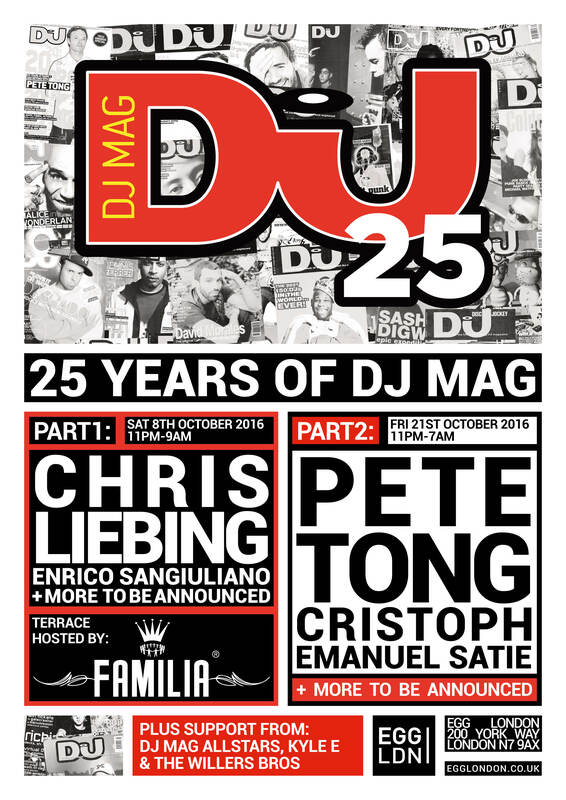 We're super excited to announce two London parties at Egg London to celebrate 25 years of doin' that ting we call DJ Mag. And what better way to commemorate a quarter-century of getting mash-up than by, well, getting mash-up (twice in one month!)? On Saturday 8th October, we're shipping legendary CLR bossman Chris Liebing to also help mark his 25 years behind the decks. He'll be joined by rapidly rising Drumcode talent Enrico Sangiuliano for a night of dark, dutty techno until dawn, plus more TBA. Stay tuned for the after-party. For Part Two (Friday 21st October), we're proud to announce Radio 1 superstar Pete Tong — picked in our pages as a 'pioneer' in our anniversary issue for giving underground dance music a platform for mainstream airways for, yep, you guessed it, 25 years! And if that's not enough, we've got Knee Deep In Sound alumni Cristoph and Emanuel Satie in support, plus more TBA. With a big party still to announce in Birmingham and another still to roll out for November, it's our birthday and we'll party if we want to..